Check Out the Pinnacle Counselor’s Corner Website! | The Pinnacle P.O.V. 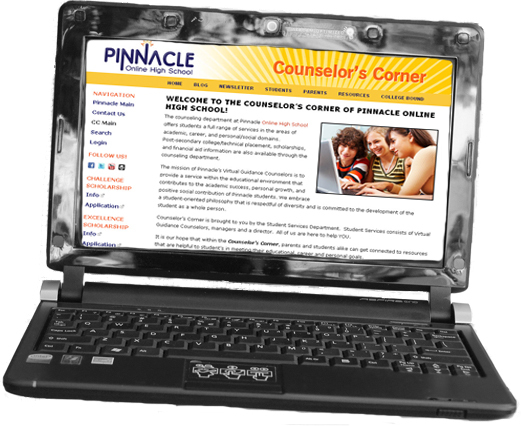 The Student Services staff is proud to introduce the Pinnacle Counselor’s Corner website. Creation of this website has been a long-standing goal of the Student Services department. They have looked forward to providing information and guidance through a unique website while also offering students a new way to receive assistance in an online setting. So after much deliberation, collaboration, and development, the long-awaited and highly-anticipated site is here. The Counselor’s Corner website is now live, and can be accessed from the Pinnacle Education website! Please go to www.pinnacleeducation.com to access the website. The Counselor’s Corner link can be found on the left side menu under Programs, as well as in the Student Portal. The main objective of this site is to provide students and parents an additional avenue to access resources, gather information, and stay up-to-date on current news and events. It will also provide students and parents with a way to connect with the student services department. Please visit the website often for news and updates. As we continue to develop content, this site will become a valuable resource! ~ by pinnaclepov2224 on November 19, 2009.